The Un-official official beginning of summer has begun. Yes, Americans often start their summer not on that calendar day in June but rather on a holiday in late May. Memorial Day. For many in the USA, Memorial day is the start of summer. 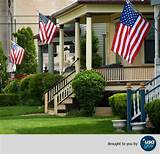 And for a growing number of Americans, its the start of a five week celebration of America as well. 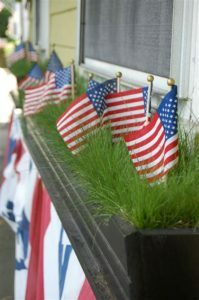 A growing number of Americans are taking the time between Memorial Day and Independence Day to be a month or so of pure American celebration. You can join this growing number of folks no matter where you are. 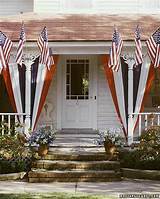 You can display the American Flag in a number of ways as well as take a number of DIY projects to another level when it comes to showing your American Pride. 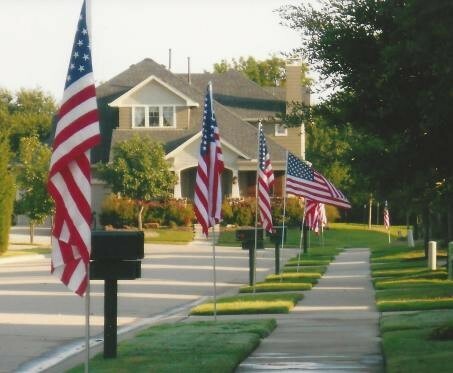 Below are a few ideas of how to display Ol’ Glory and some DIY Americana projects that will help you celebrate the holiday season as well as display your pride for the United States of America. 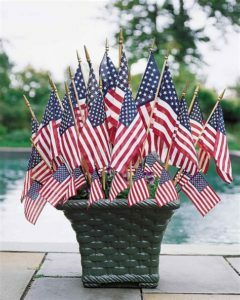 You can also add a little flag flare to your decor this American Holiday season. You can either use thread to sew these bandannas together or use no sew tape available at your craft store. Go the craft rout by taking something you probably already have in your home. 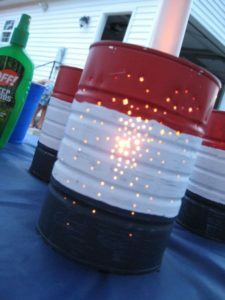 Just add a little time and paint and you got a unique yet all American item to add flare. 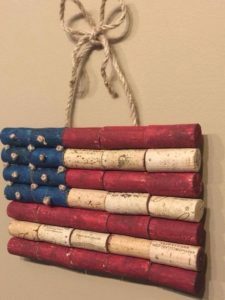 Wine corks glued together and painted in the red, white and blue. Or take tin cans and with a small drill bit or a small nail, poke a few holes and then add a candle or battery light. Need something simple for the dining table? 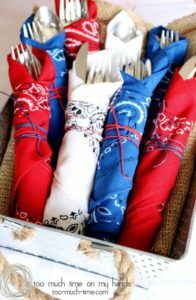 What could be more simple or easier than taking some bandannas and wrapping your eating utensils in them. 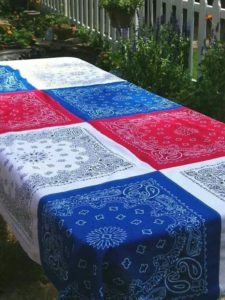 Of course, the bandannas would have to be red, white and blue. Now go and celebrate responsibly.